The Dishonored series is well known for its beautiful and intricate levels that offer up seemingly endless options and freedom. Dishonored 2 is following that trend and, if the Clockwork Mansion mission I’ve played is anything to go by, pushing the boundaries even further. 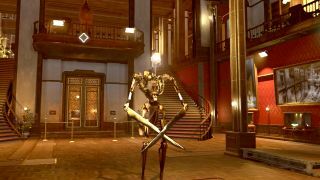 I spoke to level designer Christophe Carrier about the key things that make a Dishonored level. “I want to be immersed, if you want me to believe in the environment, I have to be able to do whatever I want so. I want to be able to do everything that I think is possible to do. One of the bases of what I like in level design is being able to do things however you want. When I play a game and I try something and it doesn’t work, it pisses me off. You have these games where you cannot jump across a small ledge – come on! [The] second thing is, I love interactivity. I love when the scenery is responding to what I’m doing, even if it’s just the traditional tap water thing where you just do this and you never use it again [or] the toilets, for example; they are totally useless but they work, and that’s cool! You just activate them and it works; OK, it’s a world that works!